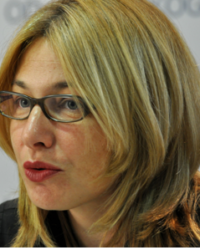 Jasna Milošević Đorđević teaches Social Psychology at the Faculty of Media and Communication (Singidunum University), Belgrade, Serbia and the University of Montenegro (Podgorica). She is also a Research Associate at the Institute for Political Studies and research consultant in Ipsos Strategic Marketing. Her M.A. and Ph.D. thesis were related to voting behavior and national identity. She has worked on various projects related to political public opinion and activism with a specific emphasis on the Balkan region. As a participant in the FP7 Project FOCUS Balkans, she was one of the editors of the book Food Consumer Science (Springer, 2013). She has published around fifteen scientific articles in national and international journals. She is currently working on civic activism, the role of contact in reducing stereotypes, and conspiracy theories (anti-vaccination).